PHOENIX — Leaders of environmental, business and faith groups on Tuesday urged Arizona Gov. Doug Ducey to take on climate change by embracing solutions such as renewable energy and battery technology. Sandy Bahr, president of the local chapter of the Sierra Club, said they sent a letter with more than 2,000 signatures asking Ducey to join governors and public officials in other states in developing an action plan to reduce carbon emissions and support the goals of the Paris climate accord. Rep. Ken Clark said he hopes the letter will spur Ducey to work on possible solutions to climate change in Arizona such as replacing gas-power with solar and battery power. “The powers that be in Arizona should not fear renewable energy,” said Clark, a Democratic legislator who represents central Phoenix and south Scottsdale. He said Arizona is falling behind. Ducey’s office did not respond Tuesday to requests for comment. 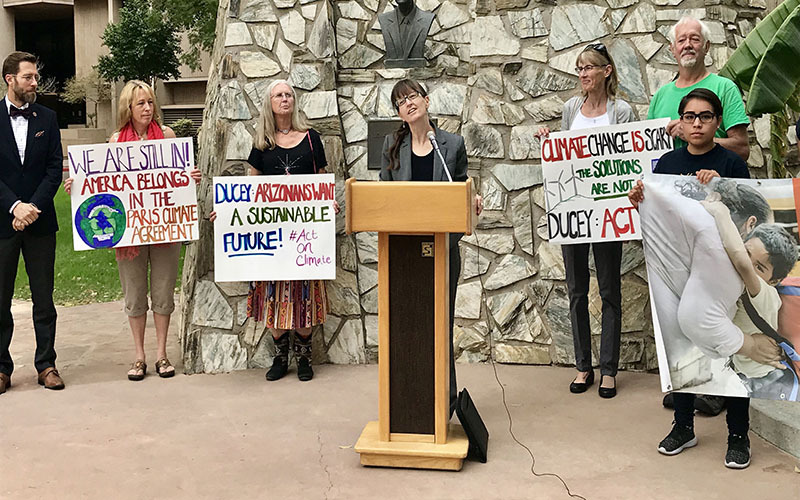 Sally Rings, of Arizona Interfaith Power and Light, said climate reforms can help businesses by providing more jobs and reducing health concerns such as asthma and state and local leaders have a greater responsibility. Vance Marshall, president of VJ Properties, Inc., said he hopes Ducey will join other state officials across the nation in the We Are Still In group that supports the Paris climate agreement.